*Let’s be the ones who go the extra mile with kindness. *We make things too complicated. I like to keep life simple. Love God. Love others. *When you express God’s goodness in the world, you are indeed making a difference. *When someone is slinging mud at us from a hardened heart, we don’t need to defend ourselves. Our life will do just that. *As we grow closer to God, we realize that a full life is not about what we get, but what we give. *Prayer gives us the ability to take life on Planet Earth very seriously because we are able to see this is not all there is. *When love is our purpose, when love is the goal, when love is our anchor, our lives and actions change to mirror the heart of our great God. *You will find when you share love or wisdom or food to eat, your supply never runs out. *Be diligent; do everything you do to please God, not out of obligation; don’t lead for what you can get but because of what you can give; don’t lord it over people but lead by example. *Don’t forget, no matter how ferocious this lion from the pit of hell appears, he can do nothing to harm us. *Please God with your obedience and service. Show your salvation through your love for others. But never forget for a second that salvation is a gift from God. *I also rest in the fact that God sees me as perfect in His sight, through the blood of Jesus and not my own works. What a relief. 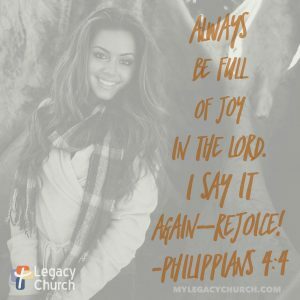 *Positive words and thoughts— as an act of the will and as an expression of our salvation— lead us to joy.